Cold Laser FAQ We encourage our patients to focus on their Health and Wellness. Q. What is Low Level Cold Laser Therapy? A. Low Level Cold Laser therapy is the use of low intensity photonic energy as a treatment modality. A. Photonic stimuli excite the body’s cells infusing them with energy, with the three primary reactions being, reduction of inflammation, cell regeneration and increased blood flow. Q. What are the benefits of low-laser therapy? A. 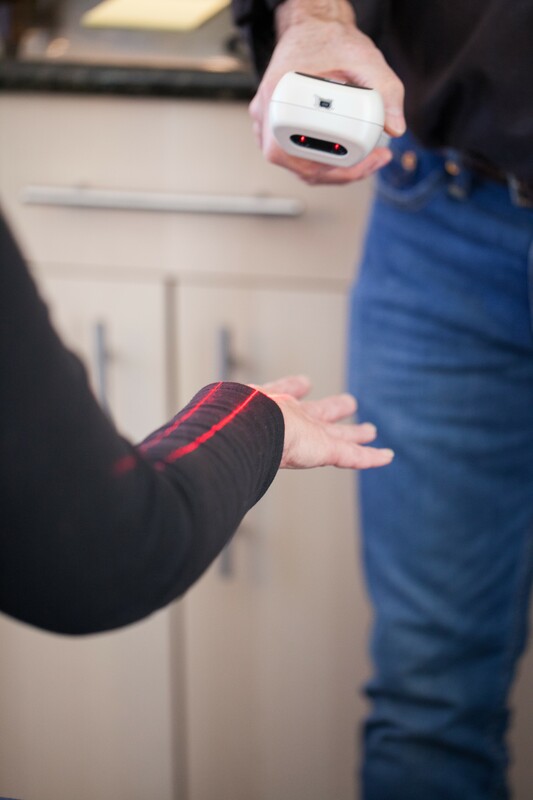 Low Level Laser Therapy is a noninvasive, fast and effective modality that has been proven in clinical trial to reduce pain, reduce edema and promote healing. Q. How safe is Low Level Laser Therapy? A. Low Level Laser Therapy has is very safe, the only general precaution is the use of special filtering glasses when a class 3B laser is in use. A. The depth of penetration is dependent on multiple factors including mass and density, however since low level laser has been proven in clinical study to effect subcutaneous cells; the point is low level laser, does penetrate; as opposed to the heat lamp devices that do not. Q. Can I use Low Level Laser Therapy at home, on myself? Q. What the difference is between pulsed vs. constant wave? A. Like their names imply, constant wave is a continuous emission of laser energy, without disruption, for the length of time the device is ON. Pulsed wave is controlled breaks in the wave, at predefined and programmed intervals. Q. What is hertz as it relates to Low Level Cold Lasers? A. The predefined, controlled breaks in the laser emission, measured by the number of breaks per second, equals hertz. Q. Is Low Level Laser Therapy painful? A. No, most people do not feel anything, for those that have reported a feeling, it is nothing more than a slight tingling. Q. Who uses the Low Level Lasers? A. Erchonia has a broad client base with representative from every practice in the health Care industry, including by not limited; Cosmetic Surgeons, Chiropractors, Plastic Surgeons, Physical Therapists, Registered Nurses and Medical Doctors. Q. How is Low Level Laser Therapy administered? Q. How long does it take for the laser to heal or improve a condition? A. This is dependent of the application, however; progress is immediately evident. A. Erchonia 3LT™ devices used electric diodes, which are high end, culminated and strictly measured within a plus/minus .05%. LEDs are inexpensive, non-focused wide range light sources. The primary difference is in performance and depth of penetration, Laser diodes penetrate, working subcutaneously, LEDs do not, affecting surface only . Q. What clinical studies have been conducted using Low Level Cold Laser? A. Erchonia has sponsored numerous clinical trials and continues to promote low level laser as a modality through ongoing research. Visit http://www.erchonia.com for more information.